"Evolution Sports Expo - World Combat Series"
IKF CALIFORNIA Timekeeper: Bruce Rasmussen. IKF CALIFORNIA Locker Room Inspectors (4): Chris Fields, Gene Fields, Victor Zaragoza & Nadine Salim & Vicente Sharp. Defeated **Jamerson Johnson (San Pablo, California, USA, 0-1, S: 2, AMMA: 1-0, 157.4, 5'8", 5-2-85, Steven Chao, - (FP: 3-18-17) - (RN: 3-18-18) - (LU: 3-20-17) by TKO at 1:37 of Round 3. Jamerson Johnson was issued a 30 day no training and 45 day no competition Medical Suspension until May 3, 2017 after TKO by Dr. Lenny Spivak MD. Sepano Hassanzadeh was issued a 60 day no training and 60 day no competition Medical Suspension until May 18, 2017 due to disloscated left shoulder by Dr. Lenny Spivak MD. Judge Marshall Walker: 19-18 Johnson. Judge Michael Rinaldi: 19-18 Johnson. Judge: Dan Stell: 19-18 Johnson. (**) Lucas Martino Registered again but was current from Feb. 4th, 2017 - Richmond, CA. Has $30 Credit or Refund. Defeated Shuo Li (San Francisco, California, USA, 1-1, S: 1, 161, 6', 8-28-98, Sam Phimsoutham, (415) 218-5633, - (FP: 10-15-16) - (RN: 10-15-17) - (LU: 3-20-17) by TKO at 1:59 of Round 3. Shou Li was issued a 30 day no training and 60 day no competition Medical Suspension until May 18, 2017 after TKO by Dr. Lenny Spivak MD. Li has a possible rib injury. Suspension can be reduced to 30 days if X-Ray is done and shows no rib injury - Must be cleared by MD for Rib injury. Judge Marshall Walker: 20-18, Li. Judge Michael Rinaldi: 20-18 Li. Judge: Dan Stell: 20-18 Li. Jason Wong was issued a 30 day no training and 60 day no competition Medical Suspension until May 18th, 2017 after KO by Dr. Lenny Spivak MD. Judge Marshall Walker: 50-45 Ramero. Judge Michael Rinaldi: 50-45 Lewis. Judge: Dan Stell: 49-46 Ramero. Judge Marshall Walker: 50-45 Vilela. Judge Michael Rinaldi: 49-46 Vilela. Judge: Marcos Rosales: 48-47 Khan. WEIGH-INS END AT 12 NOON- PM! ALL CORNERMAN REGISTRATION DONE AT THIS TIME ONLY! FIGHTERS MUST INFORM IKF OF THEIR CORNERS AT THIS TIME ONLY TO ATTAIN WRIST BANDS! NO ADDED CORNERMEN ONCE WEIGH-INS ARE COMPLETED! NO ADDED CORNERMEN AFTER DOORS OPEN FOR EVENT!!! 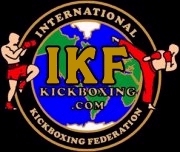 BOTH FIGHTERS NEEDS TO SUBMIT AN IKF UPDATE FORM: CLICK HERE. Jamerson Johnson NEEDS TO HAVE A FULL PHYSICAL. CAN BE DONE BY EVENT DOC AT WEIGH-INS FOR $40: CLICK HERE. Jamerson Johnson NEEDS TO GET IKF LICENSED ( $30 ): CLICK HERE. Sepano Hassanzadeh NEEDS TO SUBMIT AN IKF UPDATE FORM: CLICK HERE. BOTH FIGHTERS NEEDS TO HAVE A FULL PHYSICAL. CAN BE DONE BY EVENT DOC AT WEIGH-INS FOR $40: CLICK HERE. BOTH FIGHTERS NEEDS TO GET IKF LICENSED ( $30 ): CLICK HERE. Javier Barrios NEEDS TO HAVE A FULL PHYSICAL. CAN BE DONE BY EVENT DOC AT WEIGH-INS FOR $40: CLICK HERE. Jason Wong NEEDS TO HAVE A FULL PHYSICAL. CAN BE DONE BY EVENT DOC AT WEIGH-INS FOR $40: CLICK HERE. Jason Wong NEEDS TO GET IKF LICENSED ( $30 ): CLICK HERE. Altangerel Bayaraa NEEDS TO SUBMIT AN IKF UPDATE FORM: CLICK HERE. (**) Unless Marcos Romero can show Proof of his 3-0 Fight Record. Last fought for IKF on August 30th, 2014 - Vacaville, CA and wore Headgear in that bout - Shows no added fight since that date. Marcos Romero NEEDS TO HAVE A FULL PHYSICAL. CAN BE DONE BY EVENT DOC AT WEIGH-INS FOR $40: CLICK HERE. Marcos Romero NEEDS TO GET IKF LICENSED ( $30 ): CLICK HERE. Jeremy Lewis NEEDS TO SUBMIT AN IKF UPDATE FORM: CLICK HERE. NO HEADGEAR AND SHIN PADS REQUIRED. - BOTH FIGHTERS MUST WEAR "IKF APPROVED" ELBOW PADS. Lizbeth Swaby-Clacken NEEDS TO HAVE A FULL PHYSICAL. CAN BE DONE BY EVENT DOC AT WEIGH-INS FOR $40: CLICK HERE. Lizbeth Swaby-Clacken NEEDS TO GET IKF LICENSED ( $30 ): CLICK HERE. Thai-Ngan Le NEEDS TO SUBMIT AN IKF UPDATE FORM: CLICK HERE. Jeffrey Vilela NEEDS TO HAVE A FULL PHYSICAL. CAN BE DONE BY EVENT DOC AT WEIGH-INS FOR $40: CLICK HERE. Jeffrey Vilela NEEDS TO GET IKF LICENSED ( $30 ): CLICK HERE. Mohammed Khan NEEDS TO SUBMIT AN IKF UPDATE FORM: CLICK HERE. Aaron Luellen NEEDS TO HAVE A FULL PHYSICAL. CAN BE DONE BY EVENT DOC AT WEIGH-INS FOR $40: CLICK HERE. Aaron Luellen NEEDS TO GET IKF LICENSED ( $30 ): CLICK HERE. Cameron Church NEEDS TO SUBMIT AN IKF UPDATE FORM: CLICK HERE.